Grilled lobster tails with coriander and chilli butter sauce make a super-quick and impressive Christmas starter. Post sponsored by Iceland #PowerOfFrozen. The welcome inside was just as warm – we were treated to mulled wine and nibbles before the coats were off. The event was thrown to celebrate Iceland’s Christmas food range and chef Neil Nugent and his team put on a spectacular show, starting with Iceland’s luxury Canadian lobster tails. Neil is such an incredibly likeable, straight-talking and no-nonsense chef – his enthusiasm when talking about the Iceland Christmas food range is totally contagious. Not that the lobsters need much help to capture my attention – I have been buying them whenever in stock since rustling up these lobster puff pastry pot pies for Iceland in 2016. But I definitely haven’t taken hay and smoked my lobsters before, as Neil does – it’s such an easy way to add a special touch to an already amazing ingredient. These were served as lobster tacos with grilled pineapple and avocado – using Iceland’s frozen avocados of course. We took a short break after the lobster demo and I was naturally sidetracked by the bar where mince pie martinis were being shaken and served. Mince pie martinis are pretty amazing – didn’t think I would like them much, but boy was I wrong!! I think I will feature the cocktail recipe in another post – it was that good. The turkey demo was on next and Neil was on hand to demonstrate three ways of cooking your turkey. The muslin method, in which your turkey is draped with cloth that’s soaked in butter and wine, was my favourite method up until last year – it requires a lot of basting, but produces a lovely moist bird. Neil and his team used Iceland’s luxury gilded Turkey with mustard and honey glaze which was then gilded with some real gold leaf – taking inspiration from the 15th century trend for gilding. This product is incredibly popular by the way, so make sure you buy yours now. The second method for salt-baked turkey requires a bit more work up front – covering your turkey with a mix of salt, egg whites and water which hardens in the oven enclosing all the moisture within. Breaking the salt crust has got to be the most fun way to take out any Christmas frustrations or stress! The salt-baked turkey was incredibly moist, flavourful and delicious. I actually really would love to try this method at least once – maybe will try my hand with a chicken first though. Finally we were shown the smoked turkey that got me so excited when we walked in. Smoking a turkey in your BBQ is a excellent way of freeing up the oven and it does taste pretty awesome too. Neil advised using mild wood chips for best flavour and I have bought my Iceland turkey to try this out in a future post – watch this space! After the turkey we were onto Iceland’s luxury range of frozen desserts. 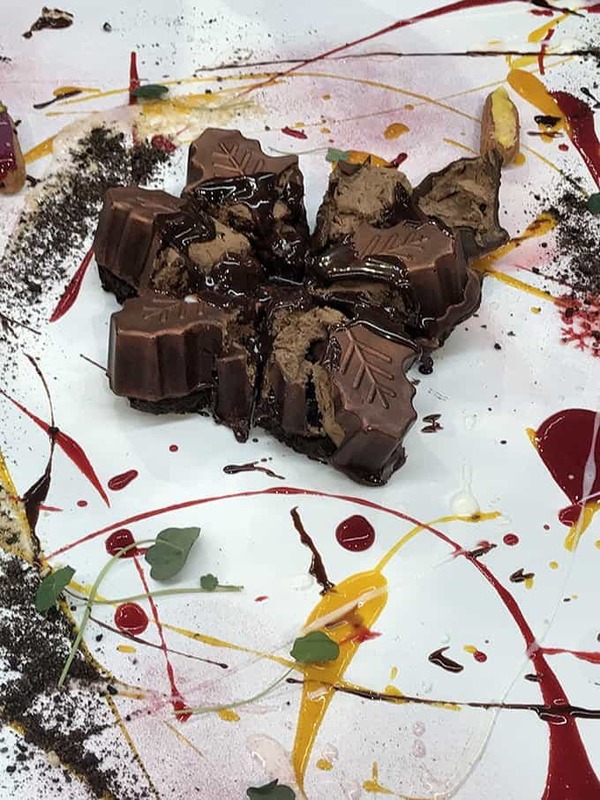 These were laid out on table and drizzled with chocolate and fruit sauces – Jackson Pollock style. The luxury melting chocolate snowflake was definitely the star of the show – a chocolate brownie base layered with dark chocolate mousse, topped with dark chocolate shell decorated with bronzed chocolate honeycomb pieces, it comes with a dark chocolate glaze which melts the middle of the snowflake when its poured on hot. It is a showstopper dessert and sure to satisfy even the most ardent chocoholic! But Iceland also have more amazing desserts up their sleeve – or freezers, I guess. The raspberry and pistachio layered pavlova looks amazing and it won Olive magazine’s join best festive show-off dessert. Again, this is very popular and sold out when I tried to buy it – but the consolation prize, Iceland’s luxury chocolate & orange choux garland (pictured above), is also totally delicious and perfect for sharing. I know suggesting you buy some of your festive desserts instead of baking them will sound pretty strange coming from a food blogger… but stressing yourself out at Christmas is really not what you need! Having a spectacular dessert on stand by in your freezer makes total sense and stocking up on Iceland’s mini luxury tarts and award winning mince pies (joint winner for Olive magazine’s best mince pies) is another no brainer. I have been nibbling on these little tarts as I type up this post. When I got home from the event I was all fired up to try the products and cooking methods showcased by Neil and his team. The turkey is still in the freezer waiting for me to find the time to smoke it but I did manage to make grilled lobster tails with coriander and chilli butter sauce. Grilling lobster tails in so easy and incredibly quick – a perfect way to create an impressive dish in under 15 minutes! I cut the shells to expose the meat, brushed with a little melted butter and grilled them for 10 minutes. The butter sauce is child’s play too – simply heat some fish stock with fish sauce and then whisk in butter, lime juice, coriander and chilli. Serve your grilled lobsters with warm coriander and chilli butter sauce as an impressive starter or lighter main with a green salad on the side. These grilled lobster tails with coriander and chilli butter sauce make an impressive starter or light main meal and are ready in under 15 minutes! Defrost the lobster tails by putting them in the fridge overnight. Pat them dry with some kitchen towel. Carefully cut along the top side of the shells using kitchen scissors. Pull the shells apart slightly to expose the meat. Preheat the grill to medium-high. Place the tails on the rack of a grill pan, brush with melted butter and season with salt and freshly ground pepper. Meanwhile put the fish stock, lime juice and fish sauce into a small saucepan and bring to the boil. Boil rapidly for one minute then reduce heat to a simmer. Add the butter, a cube at a time, whisking with a small balloon whisk to emulsify the sauce. Stir in the chopped coriander and chopped chilli. Drizzle the warm butter sauce over the lobster tails and serve immediately. Yes you too Jane! Hopefully we won’t be as busy the next time we meet and we can have a proper catch up! I’ve never actually had lobster before, but this sounds delicious! Great addition to the Christmas day table! 🙂 Definitely need to make a trip to Iceland! Truly delicious, all of it and we’ve definitely having lobster tails for Christmas Day – love the chocolate garland, too and the mince pies look very good. A beautiful post that has really got me in the mood for Christmas. And great that frozen food can take away some of the stress. This looks so fancy! No way this is ready in 15 minutes! I have always thought of lobster as this huge ordeal. I really need to try it sometime. It’s easy when you cook with only the tails. I thought the same though before I cooked with lobster! I never knew that Iceland did lobster. I will have to head down there tomorrow and pick some up. I am so hungry after reading this post and watching those videos…what an incredible experience for you! It was a spectacular event! The one thing I regret is not eating more of the food on offer – I was too distracted taking photos! This whole meal looks amazing! And those tails are beautiful! I love the plate they are one as well – very pretty!